Daily Illuminator: Zombie Dice Back In Stock! 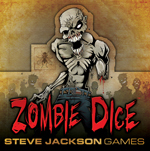 October 4, 2012: Zombie Dice Back In Stock! You asked for braaaaiiiins, we give you braaaaiiiins! One of the biggest questions to Warehouse 23 the last couple months has been "When is Zombie Dice coming back in stock?" Well, the wait is over! We can all get back to shambling, devouring brains, and dodging shotguns again, just in time for Hallowe'en! With so many people asking about it they might not last long, so be sure to get your teeth in a copy soon. And for more Zombie B-Movie action, don't forget about Zombie Dice 2: Double Feature! Pick them up either at Warehouse 23 or at your Friendly Local Game Store!